Kutonia Smith at the Music City Central bus depot called for better service and safer bus stops in Nashville’s working-class neighborhoods. She said poorer neighborhoods need good bus service but aren’t getting it. 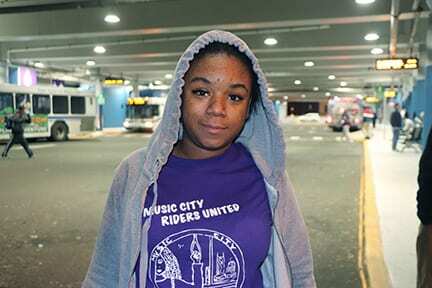 NASHVILLE, TN – Music City Riders United (MCRU) released a 19-page report last week about the quality of the city’s bus service. The grades indicate a number of problems plague the bus system. Last summer MCRU compiled 619 surveys from frequent riders on 36 of the city’s 56 routes and concluded the wealthiest districts have the best bus service and the less affluent districts, with riders who take the bus every day, have the worst. 3. Buses run frequently on weekdays. 4. Buses run frequently on weekends. 7. It is safe to cross the street to get to and from bus stops on this route. 8. There are enough bus shelters and benches on this route. 9. Bus drivers are friendly and helpful. 10. Buses run early enough in morning and late enough at night for my schedule. The Antioch 38X scored a D+. The route serves Districts 28 and 29. The Golden Valley 41 route serves District 2 and 3. It scored a C-. In contrast, the West End/Bellevue 5 was the only route to score a B. Last year MCRU successfully organized to extend the Number 22 line and increase its hours of operation in Bordeaux. Some new routes were added, 27 were changed, and the Music City Circuit route was extended to Tennessee State University. MTA’s 2018 budget was increased by $7 million. “If they look at our survey a lot of their bus riders need more service. These people are trying to get to work, get home from work. They can’t get home or some can’t get to work because they don’t have 24-hour service,“ said MCRU spokesperson Kutonia Smith. She said MTA told them they don’t have the money. “It’s always about the funding,“ Smith said. According to MTA Spokesperson Amanda Clelland, a bus shelter can cost between $15,000-$100,000 depending on a number of factors. She said there are 2,500 total bus stops in MTA’s system and 234 have shelters now. About half of city bus riders get on or off the bus at a sheltered stop. 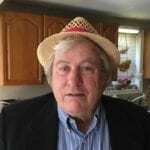 “We plan to release bus stop guidelines in the coming months,” said Clelland. She said they will help MTA identify the best places to install shelters in the future. MCRU says they want WeGo (MTA) to increase bus service to 24 hours per day and increase frequency on weekends. The report asks the City Council, Public Works, and the Tennessee Department of Transportation (TDOT) to come with a plan to put shelters and build crosswalks at every bus stop by 2020. The report noted that working people are moving out of the urban core and expanded bus service is necessary to reach outlying areas of the city. The report cited some grim statistics from another 2018 report, “Impossible Crossings”, by Walk/Bike Nashville. Since 2014, 1636 pedestrians have been hit by vehicles and 78 have been killed. “We call on the Metropolitan Nashville Department of Public Works and the TDOT to build protected crosswalks at every major bus stop, prioritizing the most dangerous intersection first,” the report recommended.